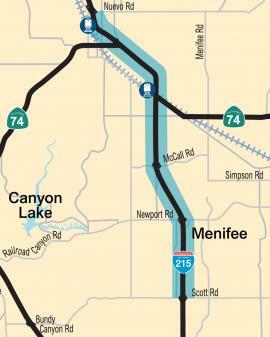 Widened 12.5 miles of I-215 between Scott Road and Nuevo Road, adding one general purpose lane in both directions. RCTC started construction in early 2013 to widen a 12.5-mile section of Interstate 215 between Scott Road in Menifee and Nuevo Road in Perris, and opened lanes in October 2015. One lane was added in both directions to provide three continuous northbound lanes and three continuous southbound lanes on I-215 between I-15 and State Route 60. Where possible, the lanes were added within the existing freeway median. In other sections with a narrower median, lanes were added to the outer edge of the freeway. Using the existing median reduced the impact to homes and businesses. In addition, the two existing freeway lanes in each direction were resurfaced, creating a smoother ride for motorists. Noise studies were performed to analyze the impacts of the project to area residents. Sound walls were built along the west side of the freeway between McCall Boulevard and south of McLaughlin Road.